Picture this terrible scenario: you are ready to open your restaurant’s doors and your main cooking workhorse – the fryer – is fried. What do you do? Do you rush out and buy the cheapest, easiest replacement just to get keep your doors open? No, that would be a costly mistake. The hasty decision to buy an inexpensive fryer could cost you more than $4,000 over the life of that fryer for natural gas alone, when compared with the energy-efficient version (source: Energy Star). Definition of fryer energy efficiency. Source: Food Service Technology Center See full size chart here. There are many energy-efficient fryers to choose from and most dealers have them in stock. Also, take advantage of the rebates that often are available from energy utilities across the country. You only make money cooking food, not wasting energy. You consume energy to light your flame, or heating elements, etc. That energy is used to melt and thaw the food, and churn out your final hot product. You pay for the energy regardless of how much of it actually makes it into the food. 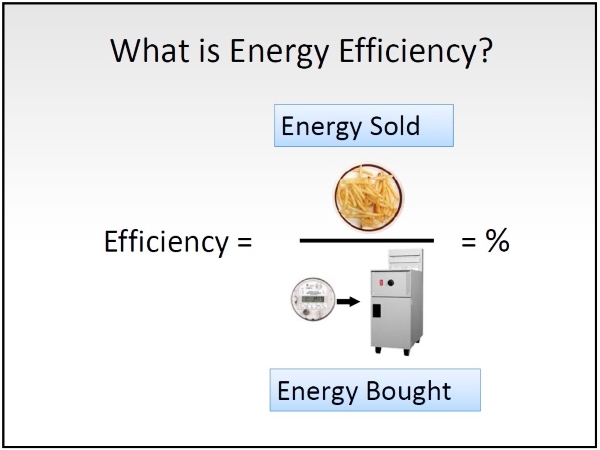 Energy efficiency means that most of the energy used goes directly into cooking the food. Put another way, if you purchase energy-efficient fryers, you are able to prepare more food with less wasted energy! And there’s more. Energy-efficient fryers recover their heat faster when you put in frozen product. This means you can cook more food and keep the hot oil consistent batch after batch of fries, fried fish, or other item. How to choose efficiency in a hurry? Buy Energy Star. When in doubt, choose Energy Star certified fryers. These models are 30-35% more energy efficient than standard ones, meaning you can save more than $100 to $400 per year (electric models and gas models, respectively) for standard sized certified fryers. Large-vat models have an even greater savings potential. This can really add up over the product’s lifetime!